From Ennis take N68 for 16 miles to junc with R484. At Crossroads Pub go right onto R484. Go through Kilmihil to T junct. Go right onto R483 signed Doonbeg GC. Continue on R483 to Creegh. After bridge in Cregh, take 1st left onto R484. As a Canadian friend said to me, the remote rugged beauty of Co. Clare is the Real Ireland, it is what tourists come to Ireland for. They want to see and enjoy its wild wonderful beauty, the crashing waves, the villages straight out of a movie set, and it is all there in magnificent Co. Clare. My friends Bud and Yvonne, I know will be in Paradise the next time they come for, on their last visit, the 5 Star luxury of The Lodge at Doonbeg Golf Club didn’t exist. It is fabulous and now owned by Trump International Hotels. Not only is there the spectacular Greg Norman designed links golf course but there is also the glorious White Horses Spa named after the white foam on the splendiferous crashing waves which lap up to the shores of Clare. Located just outside the seaside town of Kilkee, The Lodge at Doonbeg brings with it a new level of accommodation and style to the hospitality industry in Co. Clare. The interiors were created by Clodagh, the New York based Irish Designer, whom the Architectural Digest declared as one of the world’s 100 leading interior designers. The Lodge is subtle and beautifully furnished with understated good taste. The Lodge itself houses the Clubhouse, 15 Lodge Suites, the formal dining room, Member’s Bar, and Spa. There are also Garden House Suites just adjacent to the Lodge and Courtyard Suites just beyond the entry courtyard. 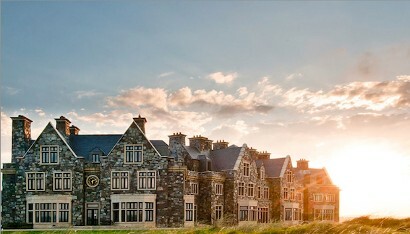 Suites at Doonbeg average 2,000 square feet and cottages approximately 3,000. There are a variety of options when it comes to dining at Doonbeg – casual and formal – to suit your particular desires on the day - and top American chef, Tom Colicchi of the Grammercy Tavern in New York was called on to advise. The Ocean View restaurant is absolutely superb. Pre-sale or salt marsh lamb is much prized in France where it is grazed on the salt herbal marshes on the borderlands between Normandy and Brittany. In Ireland Burren lamb is similarly appreciated, always a treat in Co. Clare, and you can expect the best at Doonbeg along with delicious sole, prawns, crab, and scallops. If you want to dine more informally there is Trump's, a pub and restaurant, located at the golf shop, where you can have casual food, a quick breakfast, chowder and posh fish ‘n chips at lunchtime, and in the evening a wholesome roast, or pasta, or whatever the daily special might be. The White Horses Spa by the way is on Conde Nast Traveller’s Hot List Spas and deservedly so. There are a myriad of restorative treatments involving elements of the ocean and you will be absolutely pampered. Doonbeg is perfectly placed for covering all of County Clare, the amazing Burren, the wonderful village of Doolin, Spanish Point, Lahinch, Castles and historic sites, you will be spoiled for choice. The area abounds in dinky old pubs, ceoil agus craic, and wonderful friendly people. It is only one hour from Shannon Airport so come on over. I have said enough for you can see from the wonderful images and just how amazing it would be to be teeing off right by the Atlantic Ocean with God in his Heaven.